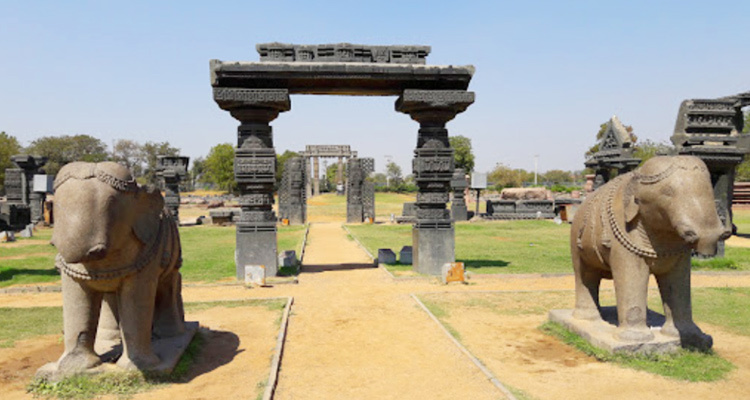 Another tourist attraction in Warangal that is worth visiting is the Warangal Fort. Built on a hillock Ekashila in 13th century, this fort is one of the architectural masterpieces of Kakatiya Dynasty. 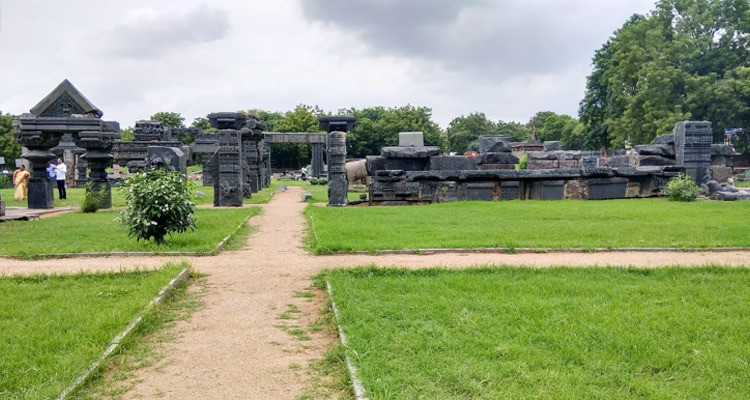 Constructed by King Ganapatideva and later by his daughter Rani Rudrama, Warangal Fort is symbolic of the historical opulence of the region during the reign of Kakatiya Kingdom. 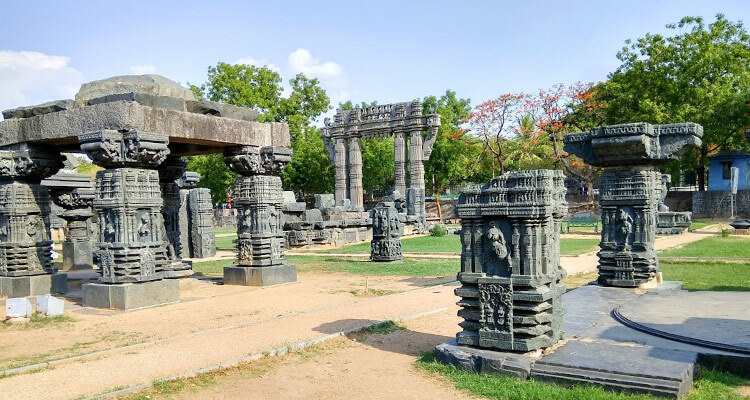 Located in south eastern side of Warangal city, it is a prominent landmark of the Telangana State, presenting a perfect example of architectural excellence and historical richness. Built in three layers of fortification ensuring absolute safety, Warangal Fort impresses every visitor with its imposing structure. Although now in ruins, the remains of the fort still present a glimpse of the mesmerizing craftsmanship and breathtaking artistry that can be seen in the motifs, sculptures, stone work, etc. Warangal fort has witnessed many battles; a few of its parts have been destroyed by various invaders too. A visit to Warangal fort is sure to leave you fascinated with the gracefulness of its architecture and brilliance that is ruins display now. The remains of the fort have been recognized as monument of national importance by the Archaeological survey of India. 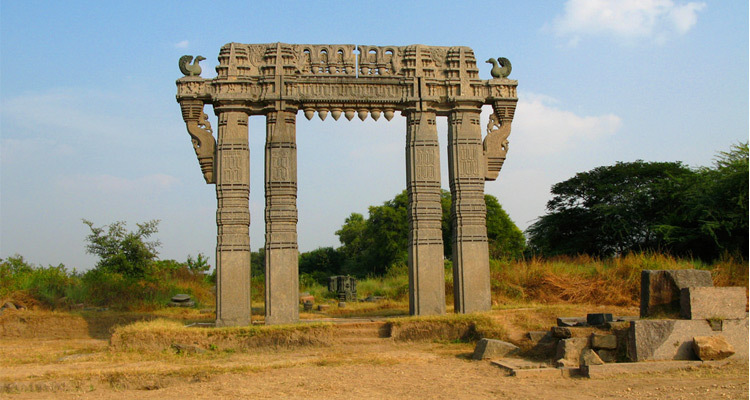 The construction of Warangal Fort was started by the Kakatiya King Ganapati Deva during the 13th century. 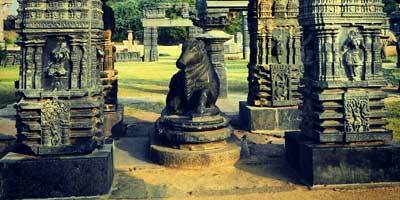 The history of Warangal fort is symbolic of the history of the Kakatiya rule to an extent. 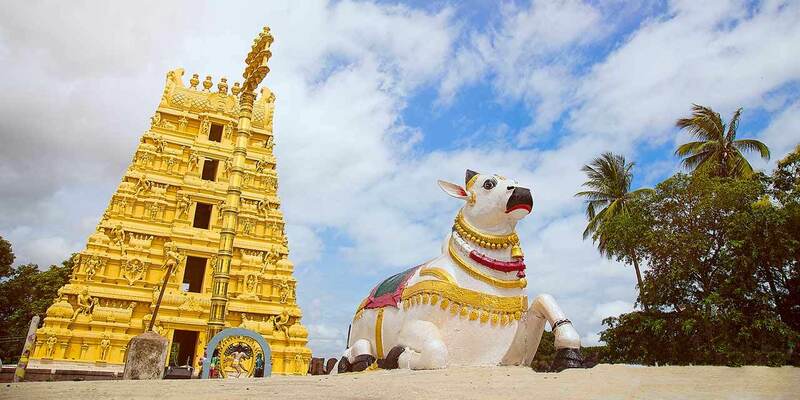 It was built as King Ganapatideva has shifted the capital of the Kakatiya kingdom to Warangal from Hanamkonda. This fort stands 12 km away from the Hanamkonda. Later his daughter Rani Rudrama, who also headed over the Kakatiya reign after her father, looked after the completion of this fort. Later King Prataparudra II who was also known as Rudradeva II, the last ruler of Kakatiya Kingdom, also made considerable addition to the Warangal Fort. This fort withstood many attacks, which led to destruction of its various parts. In 1309, Malik Kafur who was the general of Alauddin Khilji had launched an attack on the fort during the rule of Prataparudra II. An army consisting of around 1000,000 men attacked the fort in a battle that lasted for many months. The fort was then defended by the King Prataparudra II and his army. Later, many a times, Warangal fort was attacked by the Sultans of Delhi as well. Eventually this Qutub Shahi Dynasty took the control of this fort, later it was under the rule of Hyderabad Nizams. No discussion about Warangal fort is complete without mention of its structural beauty. Warangal Fort presents a glorious architecture. The fort is consisted of around 45 towers/ pillars that are built over an area of around 19 km. The most attractive part of this fort is the ‘Gateway of Glory’. This is one of the most commonly covered in the Warangal fort images. This main gateway consists of four impressively carved massive pillars that have been built out of single rock. Standing strong these pillars are around 30 feet high and present intricate carvings that are worth noticing. These majestic gateways, also known as Kirti Toranas, represent South Indian architectural style. In the middle of the fort, there is a temple dedicated to the Mother Earth named as Swayambhudevi Alayam. This temple is said to have been built by Qutub Shahi Kings. Its exquisite carvings interest every visitor. Another temple of prominence here is the Shambhulingeshwara Temple. Located opposite to the Open air museum this temple is dedicated to Lord Shiva. The open air museum is located in the center of the fort. Warangal fort boasts of three layered fortification. The fort had three circular walls, which created robust defense. The first wall of Warangal fort was built during the rule of Rudrama Devi. It is an earthen wall with a diameter of 2.4 km. Around this wall, there is a moat of about 150 feet wide, which served as outer limits of the fort. The second wall, after the mud wall and the moat was a stone wall of 1.21 km in diameter. This wall was built with massive granite stone which were closely fitted together. This was done with no mortar, showcasing another sign of architectural masterpiece. This fortified inner stone wall protected the central part, known as fort. This inner wall was built by King Ganapatideva but its height was increased during the rule of Rani Rudrama Devi. This 29 feet long wall had 45 massive towers of rectangular shape. There are 18 steps on the inner side of the earthen wall. These steps made up of stone, provided access to various locations in the fort. The third ring of wall is a mud wall of 12.5 km in diameter. 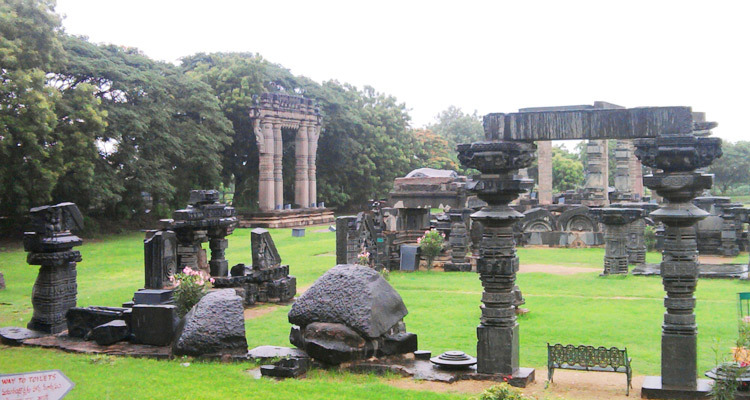 It encircles the present Warangal city. 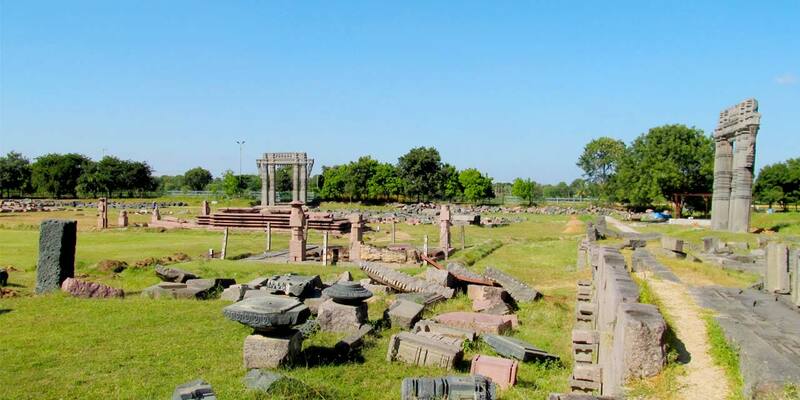 Warangal fort consists of many ruins, especially its central part which has been recognized as an archaeological zone. Most of the Warangal fort photos present a glimpse of this section. There are ruins of Shiva Temple. One can also see wall slabs, entrance pillars, ceiling panels, relic of mihrab, many small shrines, etc. The main deity of the temple, Linga with four faces of Lord Shiva has been kept in a shrine towards the southern complex of the fort. Regular prayers are offered to the Lord at the new shrine. Within the fort complex, one can also find ponds and various small temples. These remains offer an insight into the fort structure and of the Kakatiya era. Inscriptions on the pillars and the walls also speak about the period during the reign of Kakatiya Kings. The opening timings of Warangal Fort are from 10 AM to 7 PM. It is open on all days of the week. Warangal for entry fee is Rs.15 per person for those with Indian nationality. For foreign tourists, the entry charges are Rs.200 per person. The charge for video camera is Rs.25. 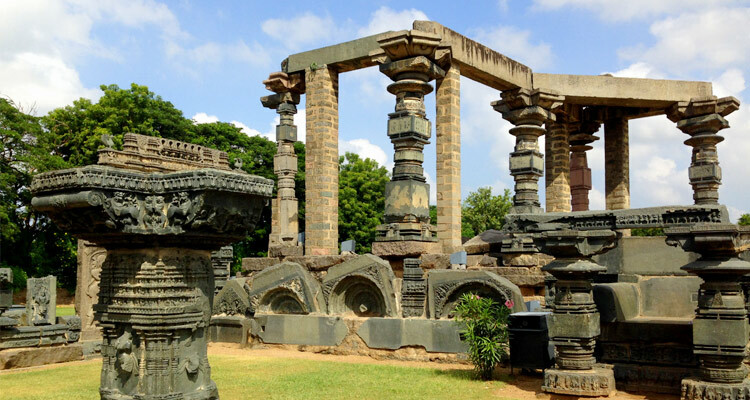 Warangal fort is located towards the south eastern part of the city. The fort is only 5 km away from Warangal railway station. Tourists can hire an auto rickshaw and reach the fort. There are also many city running regular intervals that go via the fort. Tourists can also travel via a hired taxi and reach the fort without any hassle.